Q: According to media reports, on September 27, the ROK President Moon Jae-in met with the four opposition parties, during which they issued a joint statement saying that the ROK urges the DPRK to come forward onto a path towards denuclearization and is committed to peacefully resolving the Korean Peninsula nuclear issue and that it will by no means allow the Korean Peninsula to descend into war. On the same day, while delivering a speech, Moon Chung-in, Special Adviser for Unification, Foreign and Security Affairs to the ROK President, stated that sanctions and pressure are not panacea. Resolving the current crisis on the Korean Peninsula calls for removing the strategic misgivings between the US and the DPRK. What is the most important now is the US-DPRK dialogue. If the US-DPRK dialogue was not smooth, the ROK could serve as a bridge. In order to avoid the sporadic local conflicts on the Korean Peninsula, the DPRK and the ROK need to conduct dialogue and China and Russia also need to play a positive role. What is China's comment on this? A: We have taken note of the statements made by the ROK recently. Just as what I said yesterday, the Chinese side encourages all the positive signals to call for the commitment to peacefully resolving the Korean Peninsula nuclear issue through dialogue and consultation. 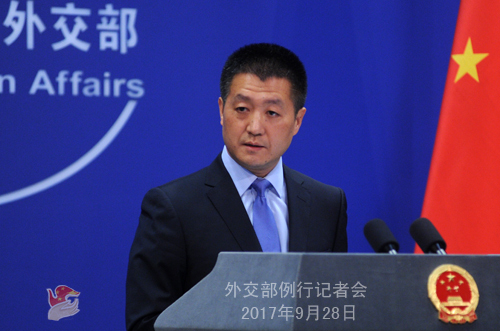 This accords with China's consistent position, conforms to the principles and spirit of the September 19 Joint Statement and meets the shared aspirations of the international community. We always approve that relevant issues can be settled through dialogue and consultation between the US and the DPRK and between the ROK and the DPRK. The Korean Peninsula nuclear issue bears on the vital interests of all relevant parties as well as regional peace and stability. It is China's consistent position to oppose war and chaos on the Korean Peninsula. The international community will not allow the Korean Peninsula to descend into war and the people to be plunged into an abyss of misery. Sanctions and promoting peace talks are both the requirements of the DPRK-related resolutions of the UN Security Council. Overemphasizing one and overlooking the other is not consistent with the spirit of relevant UN Security Council resolutions. Breaking the deadlock on the Korean Peninsula nuclear issue needs all relevant parties to demonstrate sincerity and work for the shared goal. 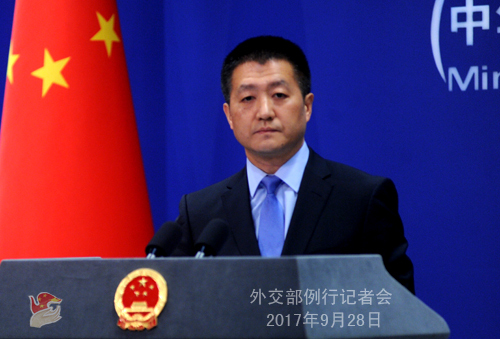 With regard to the Korean Peninsula issue, the foreign ministries of China and Russia have issued a joint statement which sets forth a joint initiative based on the "dual-track approach" and the "suspension for suspension" initiative proposed by China and the step-by-step conception by Russia. By giving full account to and accommodating the concerns of all relevant parties in a balanced approach, this proposal is fair and objective and merits the positive consideration of relevant countries. We hope that all relevant parties can play a constructive role in jointly promoting the denuclearization of the Korean Peninsula and safeguarding the peace and stability on the Korean Peninsula. Q: A couple of days ago, you said that the first batch of Chinese citizens in Dominica have been transferred after the hurricane struck Dominica. Can you give us more details on this? A: Under the coordination of China's Foreign Ministry, over the past few days, the Chinese embassies in Dominica, Antigua and Barbuda and Barbados have been assisting the transfer of the Chinese nationals in Dominica and relevant efforts have achieved remarkable progress. After the first batch of 158 people were successfully transferred to Antigua and Barbuda by ship on the evening of September 22 local time, the second batch of 306 people arrived in Antigua and Barbuda by ship on September 25. In addition, another 23 Chinese compatriots arrived in Barbados by taking the naval vessels of Barbados Coast Guards. Up to now, 487 people have been transferred from Dominica, including one Macao compatriot and two Taiwan compatriots. All relevant people have been properly resettled under the assistance of the Chinese embassies in relevant countries. To date, the Chinese nationals with the willingness to be transferred that the Chinese Embassy in Dominica can get in touch with have all been transferred from Dominica. Hereby I would like to once again extend my heartfelt thanks to the assistance provided by relevant countries and the strenuous efforts made by all. Q: In recent years, exports of Chinese military drones have been increased dramatically. The US officials have complained that China doesn't place any conditions on their responsible use before selling them. How can China ensure that these military drones would be used legally? A: With regard to the export of military products, we always adhere to the following three principles. First, it should contribute to the legitimate defense capability of the recipient countries. Second, it should not undermine the peace, security and stability of relevant regions and the world at large. Thirdly, it should not interfere in the domestic affairs of other countries. I can assure you that the Chinese side has a complete system of laws and regulations on the export of military products and that we adopt a prudent and responsible attitude toward the export of all military products, including military drones. Q: According to the report of Yomiuri Shimbun newspaper, on the evening of September 28, the Chinese Embassy in Japan will hold a reception to celebrate the 68th anniversary of the founding of the People's Republic of China as well as the 45th anniversary of the normalization of China-Japan diplomatic relations. Japanese Prime Minister Shinzo Abe and Foreign Minister Taro Kono will attend the reception. It is reported that this is the first time for the Japanese Prime Minister to be present at the reception held by the Chinese Embassy after 15 years. What is China's comment on this? A: We welcome the attendance of Japanese leaders and other senior officials at the reception hosted by the Chinese Embassy in Japan. The 45th anniversary of the normalization of China-Japan diplomatic relations is an important juncture. 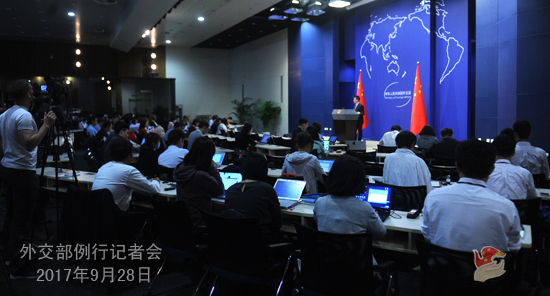 We hope that the Japanese side can make concerted efforts with China to take the opportunity of the 45th anniversary to abide by the four political documents and four-point principled agreement between China and Japan, uphold the political basis of bilateral relations, steadily advance exchanges and cooperation and promote the improvement and development of bilateral relations in the right direction in the spirit of taking history as a mirror and looking into the future. Q: The independence referendum will be held in Catalonia this Sunday. Does the Chinese side think that the people of Catalonia should be allowed to vote? A: I have taken this question before. The issue of Catalonia belongs to the domestic affairs of Spain. We believe that the Spanish central government can properly handle relevant issues and maintain national solidarity, unity and prosperity.